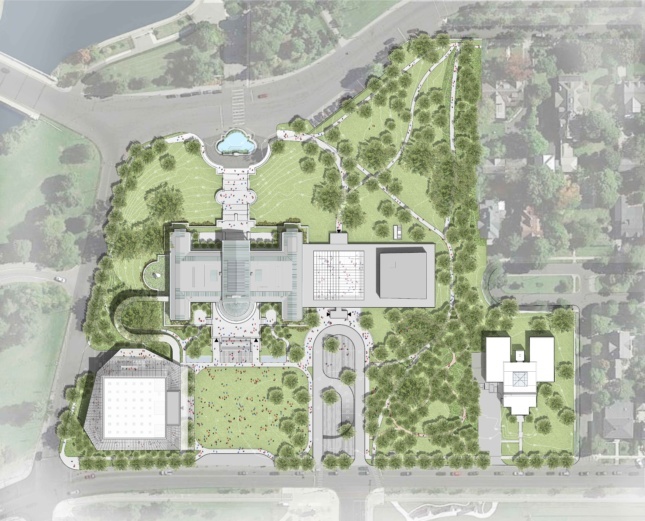 The Albright-Knox Art Gallery released its latest schematic designs in the AK360 expansion project, revealing a new direction from the previous controversial design concept. The new plan, which was developed in coordination with local, state, and national preservationists, was approved unanimously on Monday night by the Buffalo Fine Arts Academy, the board that oversees the gallery, according to Buffalo News. Under the new iteration of the AK360 Campus Development and Expansion plan developed by OMA and firm partner Shohei Shigematsu, a freestanding building will be added to the north side of the historic campus that houses the gallery in Buffalo, New York. The new building adds 29,000 square feet of space for displaying special exhibitions and the museum’s permanent collection, allowing the number of artworks that can be displayed to increase dramatically. The extension is also planned to have a double-height wraparound promenade as well as a translucent facade to connect the interior of the building to the site, a Frederick Law Olmsted-designed landscape. This ensures the preservation of the existing Gordon Bunshaft building built in 1962, which was an addition to the original Beaux-Arts museum that was built in 1905. OMA still plans to add improvements to the 1962 building taken from the first design concept. 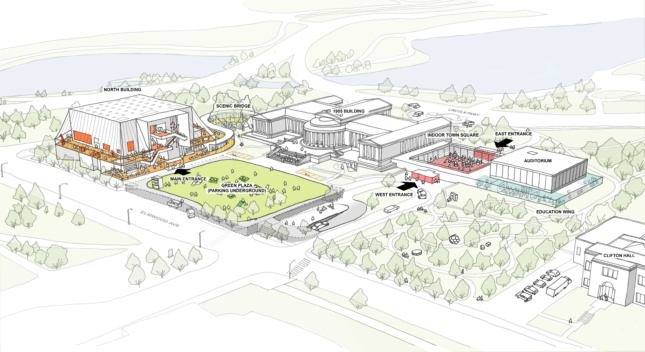 Changes include adding a new education wing in the lower level, transforming the surface level parking lot into a green landscape, and adding a new point of entry into the east façade. The open-air courtyard in the 1962 building will be covered to serve as an “indoor town square” and open the space up for year-round activities. A “scenic bridge” will connect the new north building to the original 1905 building, weaving through the Olmsted Park. Previous expansion plans included drastically transforming the Bunshaft building, rattling preservationists and igniting controversy. OMA/Shohei Shigematsu was first chosen as the lead designer for the expansion in June 2016 and released their first design concept in 2017, which proposed building two architectural volumes—one that would hover above the sculpture garden of the Bunshaft building and one that would be constructed underground along the original gallery. Opposition to that plan halted it from moving forward, until now. Fundraising for the project is almost complete—approximately $125 million is raised for the $155 million project. More refined plans for the expansion will emerge over the next months during the design development phase, which is expected to continue into 2019. Construction is aimed for fall 2019 with an expected opening in 2021.